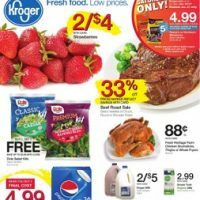 The Kroger Co. is an American retailer founded by Bernard Kroger in 1883 in Cincinnati, Ohio. It reported US$90.4 billion in sales for fiscal year 2012 (ending January 28, 2012). It is the country’s largest grocery store chain, its second-largest general retailer by revenue, and fourth-largest retailer in the world (surpassing Germany-based Metro AG in 2012), according to Deloitte. As of 2010, Kroger operated, either directly or through its subsidiaries, 3,574 stores. Kroger’s headquarters are in downtown Cincinnati. It maintains markets in 31 states, with store formats that include supermarkets, hypermarkets, department stores, convenience stores, and mall jewelry stores. Kroger-branded grocery stores are located throughout the Midwestern and Southern United States. Kroger also is parent to several “banner” chains: under the following banners: Baker’s, City Market, Dillons, Fry’s Food & Drug, Gerbes Super Markets, Harris Teeter, Jay C, King Soopers, Kroger, Owen’s, Pay Less Super Markets, QFC, Ralphs, Scott’s and Smith’s. 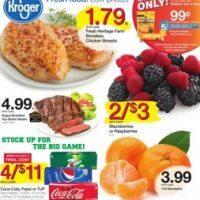 Kroger Marketplace is a chain of hypermarkets. The brand was introduced in 2004 in the Columbus, Ohio, area, which lost the Big Bear and Big Bear Plus chains in Penn Traffic’s Chapter 11 bankruptcy. 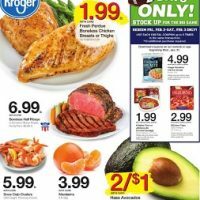 The Kroger Marketplace format is based on the Fry’s Marketplace stores that the Arizona division of Kroger is currently operating. Similar to rival chains Meijer, Sears Grand, Super Kmart, Walmart Supercenter, and Albertson’s, and modeled after Kroger-owned Fred Meyer, these stores contain multiple departments. In addition to the grocery department, they contain a Fred Meyer Jewelers, Starbucks, Donatos Pizza, and an in-store bank, as well as sections for toys, appliances, home furnishings, and bed and bath, something that Big Bear once had in their stores in the Columbus area. 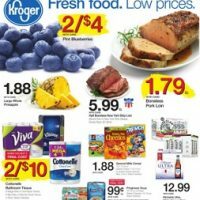 If you are interested in knowing more about the company, its statements, products, and special offers or discounts, please visit www.kroger.com. 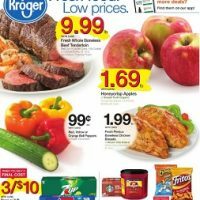 On iWeeklyAds you will find the latest Kroger weekly ad and weekly circular, online, on a single place.